“God is ascended with jubilee, and the Lord with the sound of a trumpet” (Psalms 46:5). On the feast of the Ascension of our Lord we celebrate the fulfillment of this prophecy of King David, which is used as the Prokimenon of the day. But the thought of this promise reminds us also of our responsibility. The risen Lord is no longer with us in the flesh, but only through His invisible Holy Spirit. The interim between the First and Second Coming of Christ is for us a time of witness and testimony of Him Whom we worship without seeing. The Lord, just before His Ascension, commanded His disciples: “Go ye into all the world, and preach the Gospel to every creature” (Mark. 16:15); and He told them: “Ye shall be my witnesses… unto the uttermost part of the earth” (Acts 1:8). Christ has been with us for forty days, and we have rightly feasted; we must now, being filled with the Holy Spirit of God, strive to spread His Gospel and be His witnesses before the world. For everything that we do, or fail to do, we shall be judged by Him Who shall return to earth in the same way He ascended to Heaven. With such a sobering thought in mind, how can we not be zealous to make His truth known, so that all may join in the joyous cry of this feast: “Be Thou exalted, O God, above the heavens, and Thy glory over all the earth” (Psalms 107:5). “He that descended is the same also that ascended up far above all heavens, that He might fill all things – both heaven and earth” (Ephes. 4:10). The above words, beloved brethren, have been taken by me from the holy Apostle Paul’s epistle to those inhabitants of the city of Ephesus who had been converted to the Christian faith. He says that the Lord Christ, Who came down to earth in the flesh for the sake of our salvation, after performing His great deed again ascended into heaven, or far above all heavens, but ascended as God in the flesh, or God and Man together – in two natures, but in one Person indivisibly, inseparably, unmerged. The apostle also shows the reason why the Lord did not remain on earth, but ascended into the heavens. The reason was to fill everything with Himself – both heaven and earth, to be the Head of heaven – all the angels or celestial forces, principalities, dominions, thrones, the cherubim and the seraphim, and every name that is named, not only in this world, but also in that which is to come (Ephes. 1:21), and at the same time to be the Head of the Church on earth, which He had acquired by His Blood and united with Himself. 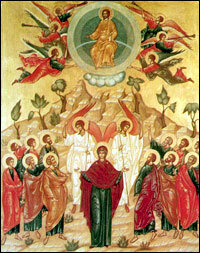 Christ ascended into heaven, yet did not leave us, His children, but remains and will always remain with us until the end of time; in His own words, He also ascended into heaven in order to send down to earth and upon His Church in His stead the Holy Spirit, the third Person of the Holy Trinity – unoriginated, co-eternal, life-giving, equipotent, equally-glorious, all-holy, all-good, all-righteous, almighty, omniscient, omnipotent, – in order that He take an equally-triumphant part in the salvation of the mankind that had been redeemed by the precious Blood of Christ. Had Christ remained on earth, the Holy Spirit would not have descended to earth, as Christ Himself announced, and that would have been unacceptable for the reason of the equality between the Persons of the Holy Trinity, and Their equal action and participation. Just as the world was created by the Word of God the Father with the participation of the Holy Spirit, so the redemption of mankind had to take place with the unfailing participation of the All-holy Spirit. What thoughts and memories does the Lord’s ascension into heaven bring to mind? – The most elevated and joyous thoughts and memories. Before Jesus Christ could ascend from earth to heaven, He had to come down to earth, become incarnate, be born of the Holy Virgin, be an Infant called Jesus, gradually grow up, reach the age of manhood, be baptized by John in the river Jordan, be subjected to temptation from the devil for the sake of our salvation, conquer him and shame him who boasted of his strength and dominion over the earth; Christ had to preach the word of God to men, commune with them for their salvation, eat and drink with publicans and sinners, talk with prostitutes in order to make them chaste, deal with the scribes and the Pharisees, instruct and censure them, heal all kinds of illnesses, resurrect the dead, show His divine power over all the elements, winds, and waters, show His power over the evil spirits and Satan’s entire kingdom, show His power over death; Christ had to endure all manner of injustice from evil people, had to suffer and die on the cross, descend into hell and destroy it, deprive Satan of all the power of which the latter boasted and thought to have forever, vanquish the sting of death and resurrect the dead, and had to rise from the dead as the Conqueror of hell and death. Before ascending into heaven He established the salvific sacraments: baptism, repentance, and the sacrament of sacraments – the holy Eucharist, or communion of His most-holy Body and Blood as a sign of His boundless love for mankind and for the purification, sanctification, renewal and deification of our nature, revived from its deep Fall and corruption. Before ascending into heaven He founded His Church on earth – a divine community of people being saved in Christ, united with each other by a single faith, law of God, divine service, clergy, and sacraments. Having founded the Church, He gave over its establishment to the apostles with the assistance of the Holy Spirit, Whom they were to receive on the great day of the Holy Pentecost. 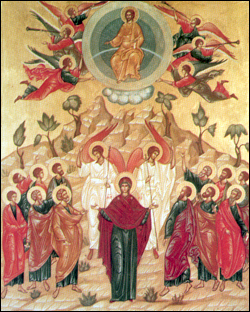 And the Church of God which was planted on earth flourished mightily, and by the grace of the Holy Spirit nurtured an immense multitude of saints from all peoples and nations, from all human ranks and positions, of both genders; especially in the early centuries the earth became like heaven due to the countless number of holy apostles, hierarchs, martyrs, venerables, unmercenaries, righteous ones, and all the saints who were glorified in the Church. Christ’s Church on earth was and is the greatest miracle; within it was performed and is being performed a wondrous renewal of mankind, whereby true believers become like the celestial angels, adorned with all manner of heavenly virtues. They have adorned the Church both with their holy lives and with their immortal and divinely-inspired writings, which forever continue to delight our hearing and to instruct the faithful. Glory to Thee, O Christ, Who had ascended with glory, our God, Who had not left us, but Who continues to act within us and save us! Amen.